Haus and Home: Mudrooms...minus the Mud! Mudrooms are a great area of the house where you can store neatly wellies, flip flops, or have it be a place to hang coats, hats, and umbrellas. One thing for sure is missing...the mud! 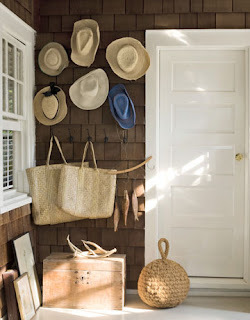 Below are some amazing examples of some of my favorite mudrooms I have come across. 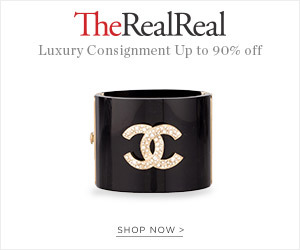 There is a decor element from fresh flowers, loose pieces of coral, or fabric seating, cohesion of matching baskets or totes for organization, and personalized elements with monogrammed L.L. Bean totes, or family photos. Which one is your favorite? 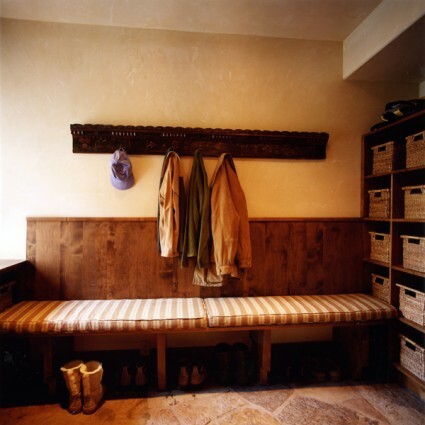 Shoe rack organized for makeshift "mudroom"
I did not include any pictures of laundry rooms, but here is an earlier post I did on some of my favorite laundry rooms. 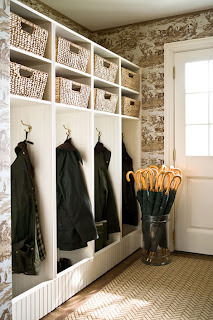 I have an odd obsession with mudrooms-I love the first, second, and barbour ones!